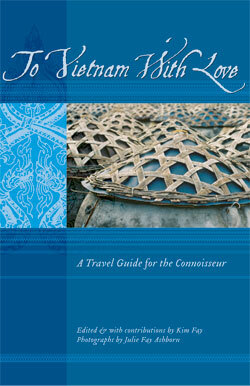 Born from the Southeast Asian guidebook that The International Herald Tribune’s Thai Day hailed as a guide with depth and color that most of [its] competitors lack, To Vietnam With Love: A Travel Guide for the Connoisseur launched the To Asia With Love series. This beautiful, full-color guidebook features a collection of personal essays by savvy expatriates, seasoned travelers, and inspired locals. Each reflection on a favorite dining, shopping, sightseeing, or cultural experience is paired with a practical fact file, so that readers can follow in the writers footsteps. From staying overnight with a local hill tribe and climbing Southeast Asia’s highest mountain, to touring historic French villas and getting involved with local charities, every recommendation captures a distinctive aspect of the country.